National Online Fundraising Courses – Adventures in Networking! Looking to upgrade or gain new fundraising skills? Not close to one of Canada’s many fundraising programs? 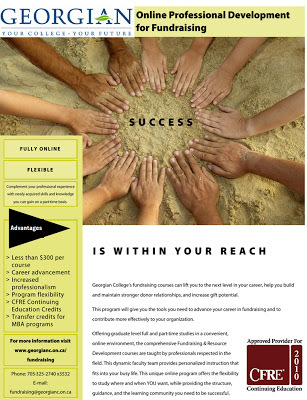 Please share news of this great certificate in fundraising at Georgian College! Yes – I’m a new instructor of the planned giving course. Would really appreciate you taking the time to share with your network. Thanks for sharing such an informative blog. I was glad to read this.